Yesterday, at 38 weeks pregnant, my sister delivered her baby. It’s a girl, though none of us knew that until the birth. She has the same middle name as Cupcake, which makes me grumble a little, but whatever. I waited on pins and needles all day yesterday, and then finally at 8pm, my brother-in-law phoned with the news. And after I said my congratulations and wished them all well, gave them all my love, did and said all the things I was supposed to, I hung up and felt my chest rip open with immense sadness. It was completely unexpected and I can’t quite explain it. But I think it has something to do with this: my sister wanted a little girl desperately. So much so that she talked of adopting one down the road if she never had the chance to give birth to one. She would watch my daughter longingly and say wistfully, “This is why I want a girl so much.” So I should be happy — thrilled — for her, shouldn’t I? But you know what? In that moment, as I heard the news, I was not. I think a part of me wanted her to have a boy because then, I would still have the one thing that she wanted the most. My sister’s life is not perfect. I know this. She has struggled with cutting herself, bulimia, depression, anxiety, and was taking meds for all of this until she got pregnant. She and her husband also have an enormous amount of debt (more debt than our house is worth!). But beyond that, I have always coveted what she has. A better house. A Master’s degree. A childhood that is not shadowed by sexual abuse. A father she respects and has a good relationship with. Fertility. It’s not fair that so many things have come so easy for her and, here again, she got exactly what she wanted: a baby girl. It’s just not fair and, instead of being happy for her, I felt sorry for myself. I know this makes me a horrible sister. I know it puts me in a very ugly light and it feels like a brave thing to do to admit to how I feel. A very big part of wanted to ignore these feelings, or lie about them, but this is the one place I am completely honest, with myself and with everyone else. I am not proud of the way I felt, but I make no excuses for it either. It is what it is. My relationship with Sis is so complicated and I am just beginning to realize all the pain that still lies under the surface and all the muck there is to wade through before I am truly healed. But please, make no mistake: I will still love this niece of mine. I hold no contempt towards her or her mother. Even today, with a little distance from the news, I am feeling better, happier, more ready to embrace the addition to our very unique family. Next weekend, we will take a road trip to meet the baby. I am excited to do so, but anxious as well. I am not sure what kind of hard feelings holding a newborn will bring up for me. 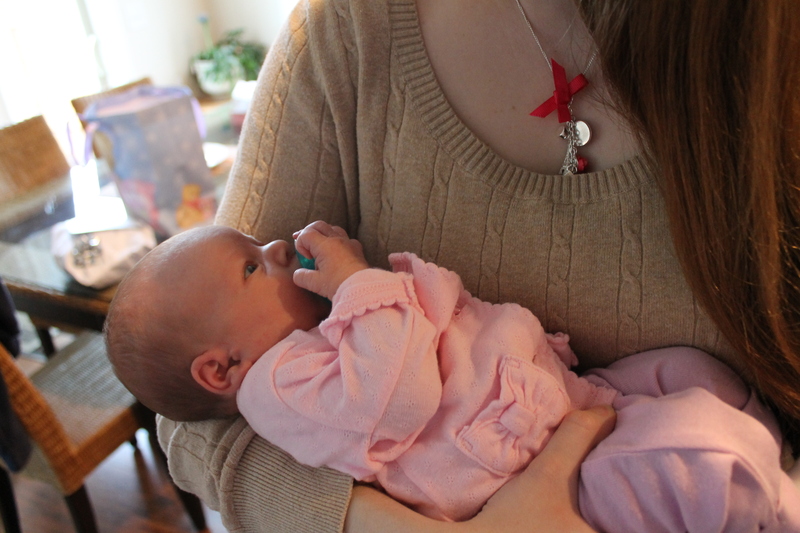 It will, in fact, be my first time holding a baby since my loss and seems like a very big step to take. My one consolation in all of this is the baby that continues to flourish inside of me. Skittle is the one who is holding me together right now, keeping my heart from being too heavy, allowing me to welcome my niece with joy. I heard the heartbeat with the doppler again today and so I can now face another baby shower this weekend with hope and relief. I am happy to carry this baby for thirty more weeks or so (please please please let it be thirty), but I cannot wait to hold this child in my arms. Hearing my sister’s birth story has only made me more desperate for another of my own. For my own child to enter this world in the same health and great expectation. I want that with every cell in my body. And I know I can do anything, I can get through this pregnancy and a cousin’s shower and holding a newborn that isn’t mine, as long as Skittle is okay. And right now, s/he is and so I will go on. Metformin: I’m still on it, 1000mg/day, and I’m happy to report I have felt no side effects whatsoever. Like, absolutely none. I also do not know that I have seen any improvements in my menstrual cycles, but I will continue with it (possibly increasing the dosage) for a few more months in hopes that it just may take a while to really go to work. My BBT: Ever since determining that it was stress causing such erratic shifts in my temp, I have implemented down-time (10-30 minutes) into my daily schedule, morning, afternoon, and right before bed. And it seems to be helping! While still not completely stable, my temp is no longer having the low dives and high spikes every damn day. I haven’t seen it go above 97.6 in over a week! And maybe it’s just a coincidence, but I like to think this is actually something over which I had a teensy tiny bit of control. My sis: Yesterday, I logged onto Facebook after breakfast to see a pregnancy announcement from my sister, her husband, AND her mom. Oh joy. I was ill-prepared and it made me cranky and weepy all morning. I had really thought my sis might warn me before she did that. I was wrong. So that’s what’s new (or not) with me in TTC-land. I’m hoping I have some actual news to report soon! And I’m not talking about a BFP. All I really want in this very moment is a positive test of a different kind. But I’m no good at waiting. No good at all. Couldn’t this be understood in so many ways? It could be speaking to each of us about this God-awful road we are all marching down — about the place that faith and hope have in all of it. If you have faith, sometimes you have to let things go. You have to believe God or some other higher power will take care of it all. It’s out of your control. And yet, you have to hold on too. You have to keep hoping. If you give up hope, you give up everything, don’t you? Or it could mean knowing when to keep fighting, to keep forging ahead, to keep believing in the dream we all covet…that little bundle of joy. But then, isn’t there a time when we might need to move on, either to the next treatment or to a new way of living, perhaps without the child we have been praying for? (Is this sort of “letting go” and moving on even possible? I don’t know that it ever could be for me.) It’s a fine, careful balance indeed. But this quote also means something else to me. It’s about my relationship with my sister. I will not be letting go of her anytime soon. I know that now, after my conversation with her yesterday. It went as good as I could have hoped for. I think we both hung up feeling like we each had our turn to say what we wanted, that we’d been heard, and that there is still a chance to heal things between us. As sams at what a day for a daydream suggested, I had a list (a long list, I might add) of talking points for our discussion. And yet, in the end, most of it went unsaid. Some of it, I felt, was petty, some of it water under the bridge, some of it things I needed to let go, some of it too hard to bring up. But I said what I needed to, I think. I feel satisfied. Mostly, I talked about my pain (thanks, Daryl, for that suggestion) — about how much infertility and miscarriage hurt, about how I am never free from the ache and grief they have both caused me. I wanted her to know that there is nothing she can say or do that can make it better, but that there are things that can make it worse. I did tell her I felt abandoned in the days after my miscarriage. That it hurt me so deeply a part of me had been trying to punish her for it all these months. That I just need her to be more sensitive and gentle with my heart. And I apologized for being so hard on her, for having such high expectations of her, for holding things against her when I have always known that her intentions were nothing but good. And she thanked me for the gift I sent and told me how much it hurt to hear that I couldn’t be happy for her (which, I will tell you now, I never said…but it’s all about perspective and interpretation, isn’t it?) and she said that she feels like she’s in such a tough place because she doesn’t know what to say to me anymore. She doesn’t want to be insensitive, but she also doesn’t want to hide her happiness. She doesn’t want to keep bringing up what I’m going through because she thinks that’s cruel, but she doesn’t want me to think that by not talking about, she doesn’t care. Both valid points, and so I explained to her my expectations on both accounts. One thing she did not say was “I’m sorry.” Not once. I did, she didn’t, but I guess that is another thing I will have to let go. I had hoped for an apology for her lack of support when I lost Teddy Graham, and for not handling these last few weeks very well, but we hardly talked about those things and she did not offer anything of the sort. That’s something I just have to accept, I guess. If there is one thing I have learned about my sister in the last few months, it is that she is rarely wrong. She is the one who is always the victim. The one who is always owed the apology. The one who has been hurt so deeply. It is never the other way around. We talked about her pregnancy, too, and about my infertility and fear for what is around the corner, and we both agreed to just be kinder to each other. More supportive. And to give one another the benefit of the doubt going forward. After all, neither one of us means to do any harm. It was not a perfect conversation — I’m realizing as I type this how much I failed to say that I probably should have — but it was successful. We cleared the air (mostly) and I felt better afterwards. I think she did, too. And so we are holding on. We’re still trying to figure this sister thing out, but we do need each other. And so, if I want this relationship to flourish, I will have to let go of the anger, the pain she has inflicted, the things she has said and done or failed to say or do. I will have to pick my battles and let go of the small stuff, everything that doesn’t matter, so it doesn’t fracture what we have. I will have to forgive. It’s a process and it will take time and I’m still learning how to do it…but I do believe it can be done. A carefully orchestrated dance between letting go and holding on…it really is a fine art, isn’t it? One I will probably be practicing for the rest of my life.